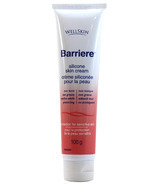 Barriere Silicone Skin Cream has been recommended by doctors, pharmacists and dermatologists for more than 30 years. Barriere Cream is an effective, multi-use protective cream. It is a favourite of new parents who have relied on it to protect infant’s skin from diaper rash; and a popular choice for the unique needs of nursing mothers, seniors, athletes, gardeners, and general labourers. Health care professionals have relied on Barriere’s therapeutic qualities to provide relief and protect against bedsores and diaper rash.